The oboe studio at UAB is instructed by James Sullivan. He is currently the principle oboist with the Alabama Symphony Orchestra. He also teaches lessons aside from teaching at UAB. Jim has several hobbies other than playing the oboe. He spends his free time gardening and spending time with his wide variety of animals. 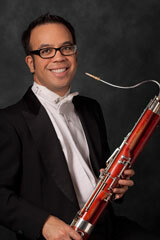 The bassoon studio at UAB is instructed by Tariq Masri. He is currently the principle bassoonist with the Alabama Symphony Orchestra.